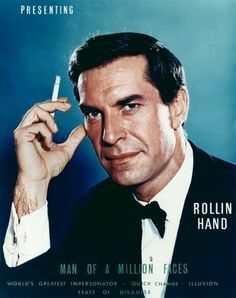 Martin Landau as Rollin Hand. On the ever of Star Trek: Discovery debuting, we are pleased to be joined by John Champion (@dvdgeeks), co-host of the Mission Log Podcast, to talk Trek and more. We begin by going over the career of Martin Landau, who passed away in July 2017. Lots of Mission Impossible chat here, including some of his most memorable episodes and also some of his other guest star appearances as well as playing Bela Lugosi in Ed Wood. We also mention a number of connections between Mission Impossible and the 1960s Star Trek show, including the overlapping guest stars and address the rumor about Landau possibly being on the list of actors to play Mr. Spock. This segues into our Trek talk, starting with Mission Log about to wrap up reviewing The Next Generation and moving on to the TNG movies and then Deep Space Nine. And we preview Star Trek: Discovery, starting next week on CBS before moving to CBS' streaming service. What do we know so far based on the trailer and advanced information? John also lets us now how Mission Log is going to cover an on-going TV show. We end with a very nerdy chat about the 1967 Bond movie Casino Royale and why we both love it, despite being "a glorified mess." Mission Log Podcast (@missionlogpod), host by John and Ken Ray (@macosken) drops every Thursday wherever you get your podcasts. 1:08 - Joe Gagne from Joe vs the World discusses wrestling podcasts, wrestling video games, Chikara, the New Japan G1 tournament and more. 23:22 - A round table discussion recorded live at Denny's to discuss the new Fantastic (in name only) Four movie, with Leonard and Todd from Longbox Heroes and Jason from Podvacacy. A few salty words get thrown in here, but can you blame us? Our pre- San Diego Comic-Con episode. Veteran comics writer Steven Grant discusses the con in the old days (Cortez Hotel), the WWE Japanese special, how his 2 Guns comic became a film starring Mark Wahlberg and Denzel Washington and comics vs Hollywood. Steve "Dr Lucha" Sims discusses Comic-Con from the perspective of an 18-year resident, the evolution of the Gaslamp district, going to see lucha libre in Tijuana in 2015 and the continuing disappointment of CMLL's Busca de un Idolo tournament this year. Co-Host of comics podcast House to Astonish Al Kennedy talks Chikara UK tour, Secret Wars, Battleworld comics and Mad Max: Fury Road. Matt D talks Secret Wars and Battleworld comics.